I've been remiss in my blogging duties lately. Summertime is just too much fun to sit down long enough to write about it! It's too fun to sit down much at all, wouldn't you say? Have you had a good summer my blog reading friend? I hope so! The station is the perfect mix of Dean Martin, Frank Sinatra, Bing Crosby, Nat King Cole, Etta James and Ella Fitzgerald. I do have to hit the "thumbs down" a time or two when they try and sneak in Otis Redding or Ray Charles. No Pandora, Ray and Otis do not fit with Dean, Frank and Bing, in my opinion. I'll thumbs up them another day. I've been enjoying a slower pace of life lately. I'm disconnecting from technology more and even TV. Just enjoying the green of the grass and the blue of the skies. Oh and the clouds....I love the clouds lately! I came over the hill yesterday on the way to church and behind the church next door to ours, the sun was shining from behind a dark cloud. It was almost like God was looking down over the two churches, side by side and shining His love down. During service, it began to rain so loudly we could barely hear Pastor speaking. I love really loud rain. As long as I don't have to go anywhere, I'm very happy when it's raining. I made something delightful tonight and last night...a cookie sundae. Made with Tollhouse chocolate chip cookies, vanilla ice cream and Hershey syrup. Oh. my. word. I've decided I like it as well as my favorite "restaurant dessert" which is the cookie skillet from Cheddar's. I can just about make it all week long for about the price of one dessert out! I'm in a domestic mood lately. Even thinking of cooking and definitely starting to look forward to the holidays. Yes, I said it. The holidays. Mainly just the fall season. I'm not a fan of hot summer weather here in the South. It's actually been quite a delightfully cool summer but I am dreading August and the thick, humid heat. 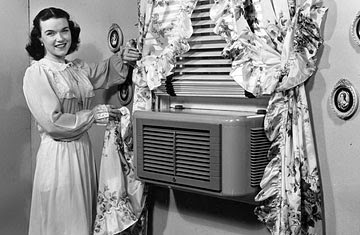 But I will try to be thankful for my air conditioning and that it doesn't still come like this...(although I would happily take those curtains!). So now I must go to bed and sleep. I just came in from picking up Caroline from a cookout. She smells of a bonfire and has one million words to say to me about her evening. The flag always makes me happy. The air is cool tonight and all is quiet here except for Nat King Cole on my docking station telling me I am unforgettable....what a voice! Good night dear blog friend! What a great post! Your pictures are really wonderful. Glad you're enjoying some summertime!! Love the cloud picture!! That Etta James is just amazing! I love that song but didn't realize that it was one of your faves too. Makes me want to run & download a whole album of her greatest hits! so poetic & pretty. your thoughts, images, & words.